Specialty chemicals maker Albemarle announced yesterday a second-quarter dividend in the amount of $0.24 per share, the same rate it paid in February after having raised it from $0.20 per share in the prior quarter. 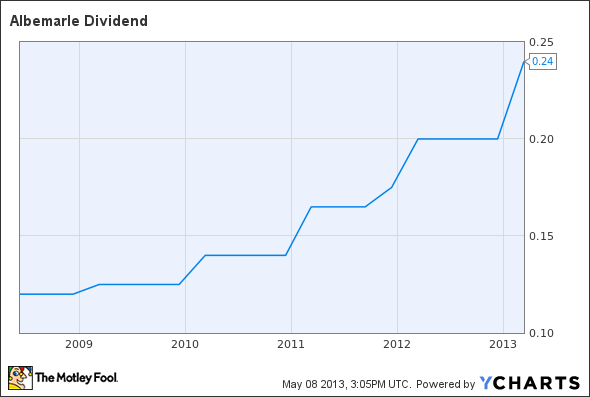 It has paid a dividend every quarter since 1994 and has regularly increased it every year since then. The board of directors said the quarterly payout is payable on July 1 to the holders of record at the close of business on June 14. The regular dividend payment equates to a $0.96-per-share annual dividend yielding 1.6% based on the closing price of Albemarle's stock on May 7. ALB Dividend data by YCharts. The article Albemarle Keeps Dividend at $0.24 originally appeared on Fool.com.